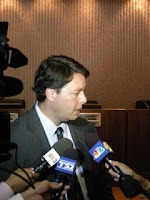 Tue sday's Costa Mesa City Council meeting has all the earmarks of being another of those long, controversial events. First, it will likely not get started at the scheduled time of 6:00 p.m. because there are four items on the Closed Session agenda that will take a lot of time. They are two separate lawsuits by medical marijuana dispensary operators; a lawsuit on behalf of day laborers and a meeting with the negotiators for the purchase of the Fairgrounds. I'm guessing that, unless they begin the closed session earlier than normal, we probably won't see the council's smiling faces on the dais until 6:30 or later. But, then, one never knows... You can read about a recent judges decision to reject a temporary restraining order request in one of the above cases in an article from the Orange County Register, HERE. Once those get vetted the open session will commence. During the Council Members Comments section I fully expect Mayor Allan Mansoor to ask the council to place on the agenda for the next study session on the 11th his bogus scheme to resurrect the illegal immigration issue. Based on his recent press conference, that could make for an interesting study session. The anticipation of Mansoor's probable action may conjure up many folks for the Public Comments segment, too. Then, the very first it em under Public Hearings addresses Gary Monahan's request to extend the hours of sale for fireworks on July 4th and to approve the renewed sale of handheld devices. That should be interesting and may generate much community response. The next items on the agenda will deal with t he distribution of Community Development Block Grant (CDBG) funds to organizations within the community. I expect that an angry old fellow in a black shirt will stand before the council and rant about how the funds are distributed - again. Giving funds to organizations that provides services to Latinos in our community doesn't fit his template for "improving" the city. His philosophy is, "If it ain't white it ain't right. If it's brown, throw it out of town." Under Old Business #1 the council will consider sweetening the retirement pot for Firefighters, from 3% at age 55 to 3% at age 50. They will also vote to modify the administrative citations procedure and authorize steps necessary to provide staff time for summer concerts. Under New Business things get interesting. Item #1 will re-authorize the Business Improvement Area (BIA) funds. Item #2, for wh ich there are no staff reports available on sections (a) and (b), deals with the potential acquisition of the Orange County Fairgrounds. Item (a) is a presentation of Ownership and Financing Strategy and (b) is a Fairgrounds Management Proposal. I'm very disappointed that no staff report is available on these items. It's difficult to be an informed voter when such things are kept behind a veil until the last minute. They might get a staff report ready by meeting time, but that won't help those of us who prefer to observe via television or streaming video. Segment (c) deals with the modification of the Standard Professional Services Agreement to accommodate three volunteers who hope to provide "expert advice and consultation". You'll be happy to know that those three fellows are Costa Mesa residents Rick Kapko and Jim Righeimer and Newport Beach resident David Ball. Apparently all three balked at the standard agreement and the first cut at modifying the agreement. It will be interesting to hear what this is all about. Finally, probably well after the normal bedtime for most seniors, the council will hear about the agreement hammered out over several months for the operation of the Costa Mesa Senior Center. This will be especially interesting because of a clause added to the agreement at the very last minute Friday night. 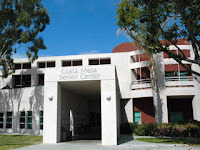 The Senior Corporation Board, the entity that operates the Costa Mesa Senior Center, had not seen the added language and, naturally, had not approved it. I wouldn't be surprised to see a few members of the Senior Center speak up on this issue. That may make what one might expect to be a pretty routine vote take on a more heightened intensity. I don't like the idea of Righeimer as a negotiating member of the Fairgrounds purchase. He has too much history in this whole process. He admitted to speaking with Ackerman and was in support of selling the Fairgrounds the entire time. How buddy-buddy is he with the members of the Fairboard? I can never recall him publicly opposing the sale. At the Eastside forum he presented his recent loss of his column as a consequence of his trying save the Fair. I have heard and read about an argument he had with an equestrian and if true should absolutely bar him from this. Finally what about his voice mail? I am sure that it has to do with this item in some respect. Anyway I would feel more comfortable if he wasn't involved.